At least once or twice a week, I go food shopping. While some might imagine me pushing a cart through the aisles of a grocery store, these weekly trips take place in my dining hall. With Tupperware and plenty of zip-lock bags in tow, I scan through the buffet and the salad bar selections of the cafeteria to see what items I can smuggle outside the door in order to whip up creative, healthy meals in the comfort of my own kitchen. Although I have heard stories about students who managed to leave Georgetown’s dining hall with a panini grill, giant tubs of ice cream, and even an entire cake, my loot is typically more discreet. Extra slices of bread and pieces of fruit are some of the easiest things to sneak into my bag for later. Despite many school policies that prohibit the removal of food from the cafeteria, the high prices of college meal plans and costs of stocking one’s own refrigerator can convert many students into petty thefts. So long as one does not attempt to steal the waffle maker or an entire tray of grilled chicken, use the dining hall to your advantage and consider investing in the following five items for a week’s worth of meals. 1. Salad bar items. The dining hall salad bar is the ultimate spot for stocking your refrigerator. With an assortment of vegetables and other toppings, you can create an easy stir fry dish without having to buy ingredients in bulk. Snag some beets and carrots for this unique twist on panzanella salad. Take some beans and sweet potatoes to make these delicious veggie burgers. Or, simply gather whatever looks good for a healthy salad to be enjoyed later. As strange as it might sound, you can even create dessert by loading up on grated carrots. The vast selection means endless possibilities. 2. Cheese. A recent article in Food Network Magazine identified that many items in grocery store salad bars are bargains compared to retail price, particularly cheeses. 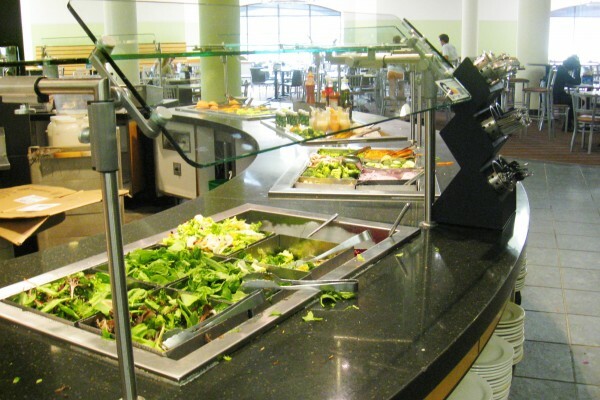 For college-strapped college students, taking advantage of the varieties in the cafeteria is an easy way to save money. Load up on cheddar cheese for those days when you crave macaroni and cheese. Adding feta cheese to a bowl of pasta elevates the dish to another level. Whether as a pizza topping or for lasagna, mozzarella is never a bad choice. Of course any variety can be used to create a quick quesadilla. Those willing to test their looting limits can even combine favorites to create a rich, baked pasta dish unparalled to anything served in the dining hall. 3. Rice. Rather than spending money on extra cartons of rice from Chinese take-out, scoop up this carbohydrate at the buffet to create meals all week long. Whether white or brown, use it as the prime ingredient to prepare these easy one-serving peanut or coconut kale rice bowls. For breakfast or an unconventional dessert, rice pudding cereal is a warm, cozy treat. 4. Cereal. Admit it: when arriving at school there was a lot of joy in seeing a bottomless selection of cereals that were forbidden when mom did the grocery shopping. Indulge in all the sugary goodness denied to you in childhood, but also load up for creating other dishes worth waking up for in the morning. In this recipe for french toast, try coating the bread in crushed corn flake cereal instead of cornmeal. Crispy rice cereal is a little dry on its own, so use it to make granola bars or chocolate bark. You can even create a unique sweet and savory combo by grinding Cap’n Crunch cereal as a breading for baked or fried chicken tenders. 5. Fruit. Fruit is by far one of the easiest things to sneak out of dining halls. As apples come into season, pilfer one or two (or five if you are really sly) and enjoy them in any of these dishes. Slice up some extra bananas, cover with chocolate and freeze for frozen bonbons perfect for an afternoon pick-me-up. With those yellow fruits forgotten and overripe in your backpack, make muffins. Enjoy a juicy orange, but save its zest to bake this light pound cake. And don’t forget about dried fruits; they are great for stews, oatmeal or a simple snack. When it comes to re-purposing food from the dining hall, your imagination is the only limit. We’d love to hear your favorite foods from the cafeteria — let us know what you like to, um, borrow in the comments! When I was in college I made all of my apple crisps with apples that I took from the dining hall – I guess that’s why golden delicious apples still make my favorite crisps! Hautelinks: Week of 9/15/11 « live clutch . : connect. discover. share :. Hautelinks: Week of 9/15/11 « Fashion Show Blog!!!! You’ll be in actuality a wonderful web site owner. The internet site running speed is actually incredible. It seems that your are performing almost any special trick. Likewise, This material are usually masterwork. you’ve got performed a terrific exercise about this issue! You’ll be in actuality a wonderful web site owner. The internet site running speed is actually incredible. It seems that your are performing almost any special trick. Likewise, This material are usually masterwork. you’ve got performed a terrific exercise about this issue!